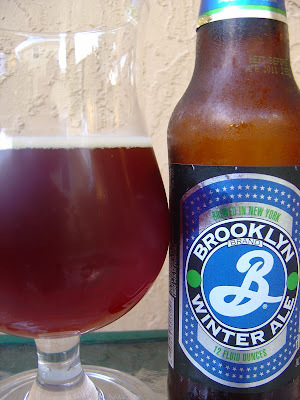 Today I'm drinking Brooklyn Winter Ale brewed by The Brooklyn Brewery in Utica, New York. 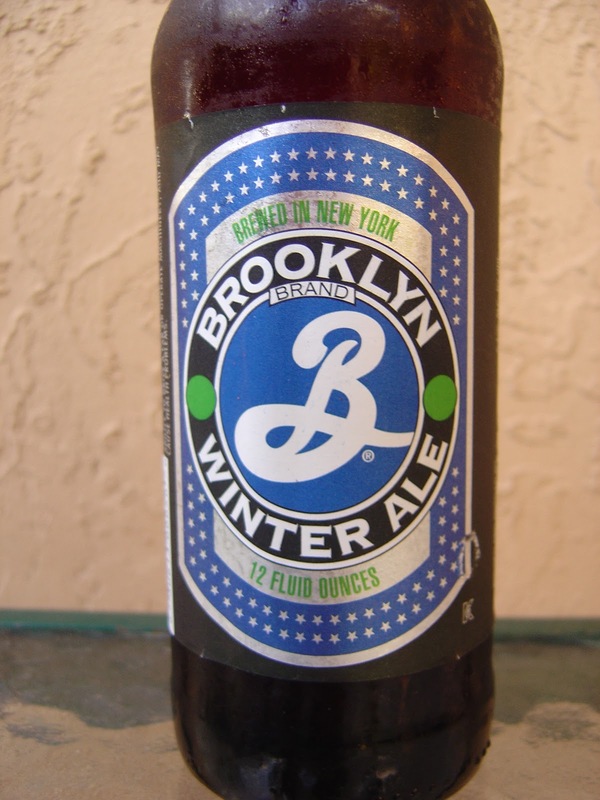 The front of the label prominently says "Brewed In New York". I've heard it mentioned before, but this was the first time I felt they were being a bit misleading considering the name of the brewery and its location; Utica is technically in New York State, so you decide. 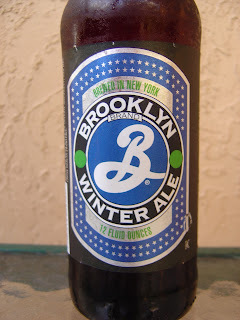 Nice label with the classic Brooklyn Brewery script B presented in blue and silver with green accents. Best before April, 2011. Malty with bread and a little herbal aroma. Sweet start flavorwise, with a bit of caramel, but that is overtaken right away by a strange medicinal and vegetal taste. Very unpleasant. Hops but not bitter. Tea, earth, dirt. 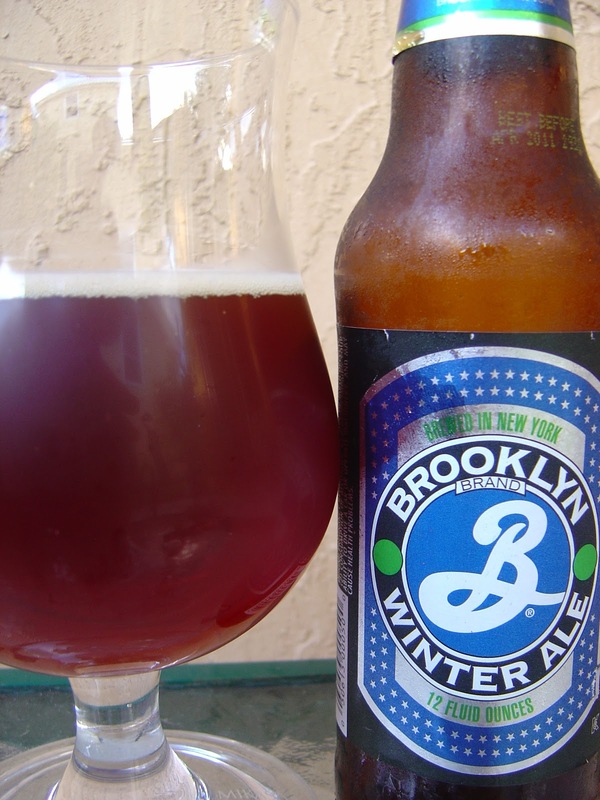 Wow, I really can't believe I am dumping a Brooklyn Brewery beer, but yep, good-bye! Yuck to the yuck! Worst beer from this brewery to date. Thank God Garrett isn't coming anytime soon. The 6.1% alcohol was not noticeable, at least for the portion I drank. First time I've seen you throw away beer! You should try Nochebuena, it's a winter beer produced by Modelo company, Mexican of course. I can usually power through a mediocre beer, but I have been known to dump one here and there. Wow! Swill alert! I've been to the Matt Brewery in Utica and I had a great time and enjoyed the various brews at the various stages. Was a great tour and day. I love the pouring down the sink shot! Riddle me this: I have been dieting and doing great. Haven't had a beer or a drink in 6 weeks. But all bets are off Thanksgiving. Give me 3 suggestions and I'm going to have all three! Yeah the Matt Brewery and their Saranac brand is totally solid, great beers up and down. Where you live is totally going to dictate what beers are available for your Thanksgiving "feast". I'm going to give you a few of my favorites as ideas, though I'm not sure you will be able to find them. Suggestions if they are available near you. The Bruery Autumn Maple, Sierra Nevada Estate Homegrown Ale, Dogfish Head Olde School Barleywine. I would recommend sharing them all and be aware that they have high alcohol content.